﻿Stethoscopes are often seen as a symbol of healthcare professionals and produce important diagnostic information. The sound the heart and surrounding organs make can be crucial indicators when examining a patient. Although the stethoscope was invented by René Laennec in 1816, smaller improvements have later been made. During the 1850’s Arthur Leared invented a binaural stethoscope, and in the 1940’s it became double-sided, one used for the respiratory system and the other for the cardiovascular system. Later, improvements were made to reduce weight, improve acoustic quality and filter out external noise. Electronic versions have been introduced to further amplify sound, and the stethoscope is now available in a wide range of styles and designs, including a 3D-printed version. The Berkeley-based startup Eko Devices has developed an adapter that transform the analog stethoscope into a powerful digital tool. 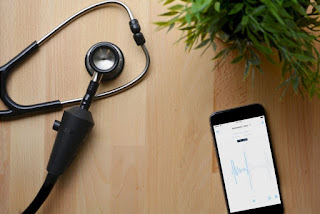 The device, called Eko Core, attaches to your existing stethoscope and while you still can have the analog sound from your stethoscope, it is also transmitted wirelessly via Bluetooth to a smartphone or tablet. Using the accompanying app, you can amplify and filter the sound, as well as visualize the waveforms in real time to better differentiate between innocent and pathologic heart conditions. The product also have other innovative features that are useful outside the primary care setting. Both the visible and audible data can easily be shared between doctors and hospitals for expert opinions, and the data can be synced directly with your EHR. The Eko Core can also be used in an educational setting where students are allowed to access heart sounds to practice their auscultation skills. The innovative device recently received FDA approval and can be purchased for $199, or $299 with an attached analog stethoscope. The company is also working on developing an algorithm that analyzes the data collected in order to match heartbeats to conditions in real-time. The condition-detecting feature will undergo separate FDA testing, and is expected to launch later this year.